In his autobiography My Last Breath, Luis Buñuel expressed his bewilderment at the fulsome reception given to his 1959 film Nazarin by official bodies representing the Catholic Church. The film was considered to be the director’s “attempt at personal rehabilitation” after an artistic life in which he had made little attempt to hide his surrealist-influenced anti-clericism. Buñuel himself, faced with criticism from key surrealists such as Jacques Prévert, always denied a supposed softening of his attitude toward organised religion (1). 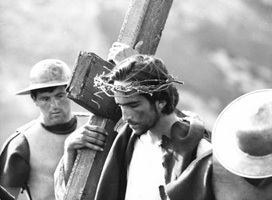 The Gospel According to Matthew has been viewed as the last of Pasolini’s initial cycle of films, coming after his first two full features Accattone (1961) and Mamma Roma (1962). This phase was marked by Pasolini’s recherche d’un style, his grappling with a new medium for which he had little technical preparation. These early films challenge traditional filmic grammar in much the same way as the work of Pasolini’s cinematic inspirations Sergei Eisenstein, Carl Theodor Dreyer and Charlie Chaplin. The Gospel recounts the life of Christ from his birth to his crucifixion and resurrection and was filmed in the Italian meridione with Basilicata doubling for Palestine and areas in Puglia, Calabria and Lazio doubling for Galilee. Surrounding himself with his regular collaborators (including cinematographer Tonino Delli Colli and editor Nino Baragli), Pasolini assembled a cast composed largely of non-professionals. For the role of Christ, the director had initially thought of, amongst others, Soviet poet Yevgeny Evtusenko and beat generation novelist Jack Kerouac. However, the central role was given to Enrique Irazoqui, a young student of Catalan literature who, having written an essay on Pasolini’s 1955 novel Ragazzi di vita had arrived in Rome to try and meet the writer-director in person. Irazoqui was chosen because of his striking similarity to the paintings of Christ by Spanish renaissance painter El Greco, especially in works such as the famous altarpiece El Espolio (1577-79). Indeed, Pasolini drew great inspiration from figurative art. In an interview from 1962 he talked of this influence, stating “what I have in mind when I formulate a series of shots are the frescos of Masaccio, or Giotto […] my camera moves over my subjects as if it were moving over a painting” (3). The director’s use of sound is also decidedly singular. Pasolini eschews the lush Rózsaian orchestral scores of Hollywood biblical epics such as King of Kings (Nicholas Ray, 1961) and employs a variety of musical pieces ranging from Bach’s “St. Matthew’s Passion” – which he had already used in Accattone – to pieces by Mozart and Prokofiev to popular Russian songs, Congolese spirituals and, memorably, in the sequence when Joseph and Mary receive three wise men bearing gifts for the baby Jesus, Odetta’s spine-tingling version of “Sometimes I Feel Like a Motherless Child”. The film displays the director’s fascination with the expressiveness of the human face. His camera lingers over the unadorned, striking faces of his non-professional actors. The opening shot of the Virgin Mary in medium close-up is followed by a series of wordless shot-reverse-shots of Mary and Joseph as they are given news of the coming of Jesus. This “cinema of glances” undoubtedly finds its filmic inspiration in the expressionism of the silent era and in particular, in the last great film of the era, Dreyer’s La Passion de Jeanne d’Arc (1928), a key aesthetic influence also in terms of camera movement. Delli Colli’s camera is increasingly mobile, whether tracking across the faces of the apostles as they listen to the teachings of Jesus or adopting the point of view of the apostles in following Jesus from behind. It is interesting to note how many of Pasolini’s collaborators (Delli Colli, Baragli) were also regular collaborators of Sergio Leone whose aesthetic – apart from his shared fascination with the landscape of the human face – appears to be the complete antithesis of Pasolini. Another link with Leone is actor Enrico Maria Salerno who, in 1964 not only dubbed Clint Eastwood in Leone’s Fistful of Dollars but also dubbed Irazoqui as the voice of Christ in The Gospel According to Matthew. More than the physical performance of the young Catalan, it is the booming, forceful voice of Salerno echoing across the weathered ancient landscape that is key to Pasolini’s representation of Christ as a revolutionary, as a masterful orator and communicator of ideas. In this sense, Pasolini was inspired by the figure of Lenin and the cult of personality which is, in essence, a “divinisation”. Essentially however, The Gospel According to Matthew is an attempt by the director to identify himself with the figure of Christ, a revolutionary who accepts that his lifelong work, his relentless non-conformity, will inevitably lead to his death. Pasolini himself believed that death would not rewarded in Heaven, “the only thing that gives man greatness is the fact that he will die […]. Catholicism teaches us that beyond death there is another world […] in my films there are no such promises, there is only death, no hereafter.” (4) For Pasolini, it is the sacredness of human life, the knowledge of its inevitable end, which leads man to act to leave a mark on the world. As Buñuel recalls, “This misunderstanding […] went on for some time […] I was actually invited to New York by Cardinal Somebody-or-Other to receive a special award for the film.” Luis Buñuel, My Last Breath, Jonathan Cape, London, 1984, p. 216. Pasolini quoted in Serafino Murri, Pier Paolo Pasolini, Il Castoro, Milano, 1994, p. 57. Pasolini in an interview published in Il Giorno, 20 May 1962. Pasolini quoted in Murri, p. 50.